Unfortunately, nobody is going to be held accountable for the atrocity taking place in Gaza. Not today, not ever. 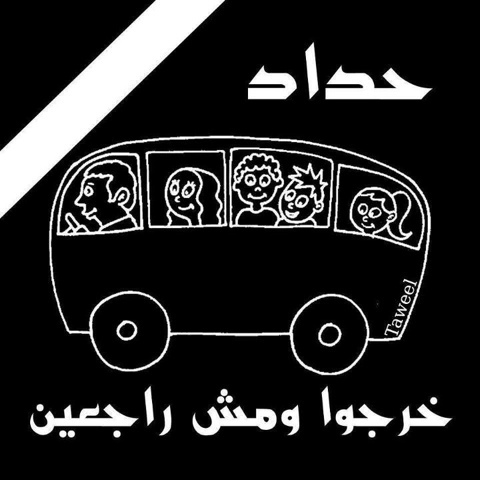 But for sure somebody (and not only the corresponding) should be held accountable for the school bus’ accident that killed more than 50 innocent children in Egypt yesterday. I don’t care if stupid people drive without using their brains once and put only their life under threat. But those who risk children’s survival should be harshly punished. I’m not in favor of death penalty but I sometimes toy with the idea when it comes to that kind of unfair events. Innocent pupils killed by somebody’s irresponsibility. Never again. Egypt also has to speak out for what is happening everyday in its roads. That reminds me of a striking headline I read last year in Al Ahram: “number killed in Egyptian car crashes last year exceeds Revolution’s martyrs” (pretty clear, isn’t it?). Official estimates place the number of deaths resulting from road accidents in Egypt around 6,000 to 8,000 per year (plus tens of thousands of injuries, both physical and psychological). It’s the future we are talking about. And those kids held a much brighter one. Guess which is the most militarized territory in the world?